Supreme Court Justice Antonin Scalia died at the age of 79 on Saturday. It was an apparently peaceful death, by all accounts, in his bedroom at a West Texas luxury resort after a weekend of quail hunting. He has children and grandchildren and Ruth Bader Ginsburg to mourn him; let’s not do that here. Because Scalia, while brilliant, was also a titanic, sweeping, one-man disaster for LGBT rights, racial justice, abortion access and general human decency. As we consider the chaos that’s about to envelop the country as a result of this sudden vacancy on the court, let’s also take a brief stroll through some of the many hideous and inexcusable things Scalia said or wrote over the years. Where do we begin? Once we do, can we ever stop? Scalia’s view on Roe v. Wade was that it should be overturned, because our founding fathers didn’t go around having abortions. That is, publicly at least, the basis for most of Scalia’s particularly bad opinions: a rigid insistence that the Constitution should mean exactly what it meant 200 years ago. The issue is whether [abortion] is a liberty protected by the Constitution of the United States. I am sure that it is not. I reach that conclusion not because of anything so exalted as my views concerning the “concept of existence, of meaning, of the universe, and of the mystery of human life.” Rather, I reach it for the same reason I reach the conclusion that bigamy is not constitutionally protected-because of two simple facts: (1) the Constitution says nothing about it, and (2) the longstanding traditions of American society have permitted it to be legally proscribed. One of the things that upsets me about modern society is the coarseness of manners. You can’t go to a movie—or watch a television show for that matter—without hearing the constant use of the F-word—including, you know, *ladies* using it. People that I know don’t talk like that! But if you portray it a lot, the society’s going to become that way. It’s very sad. The substance of today’s decree is not of immense personal importance to me. The law can recognize as marriage whatever sexual attachments and living arrangements it wishes, and can accord them favorable civil consequences, from tax treatment to rights of inheritance. I have friends that I know, or very much suspect, are homosexual. “We have never held that that’s contrary to the Constitution. And I don’t know what provision of the Constitution that would, that would contravene. “Listen, I think it is very facile for people to say, ‘Oh, torture is terrible.’ You posit the situation where a person that you know for sure knows the location of a nuclear bomb that has been planted in Los Angeles and will kill millions of people. You think it’s an easy question? You think it’s clear that you cannot use extreme measures to get that information out of that person? I don’t think that’s so clear at all. “There are – there are those who contend that it does not benefit African Americans to ­­ to get them into the University of Texas where they do not do well, as opposed to having them go to a less­-advanced school, a less – a slower-track school where they do well. Finally, let’s take a look at perhaps the only useful thing Piers Morgan has ever done: an interview with Scalia in 2013, wherein his extreme indifference about whether the death penalty is killing innocent people is fully on display. He’s also not sure whether the framers of the Constitution had different ideas about women’s rights than we do today. Just genuinely thought you could argue a different side on that one. 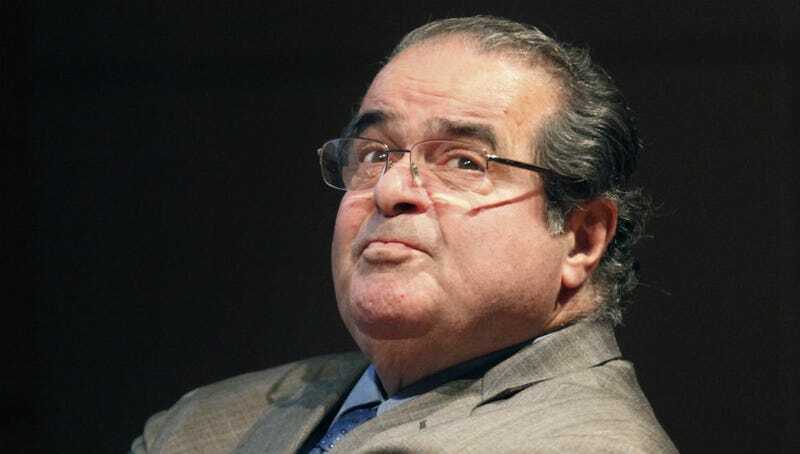 Everyone deserves to rest in peace, we suppose, but Scalia is certainly not entitled to any special measure of it.